Expect nothing less than a total sellout on Saturday as two of the DFW's top teams meet up in what is a much-anticipated showdown. Southlake Carroll, under first-year head coach Riley Dodge appears to be peaking at the right time. In its three playoff wins, SLC has outscored Coppell, DeSoto and Trinity by a combined 130-37. Last week’s 35-7 win over Trinity may have been the Dragons' most impressive performance to date. T.J. McDaniel had over 100 yards rushing and two scores and QB Will Bowers tossed a pair of scoring passes. However, it was the Dragons defense that was the story, the front seven was dominant against Trinity holding the typically vaunted Trojans rushing attack to just 118 yards for the evening. After a sluggish start to the playoffs against South Grand Prairie, Duncanville’s defense has totally dominated the last two weeks. Last week in a 45-6 rout of Arlington Lamar, the Panthers held an explosive Lamar offense to just two first-quarter field goals, while QB Ja’Quinden Jackson totaled 298 yards of offense and three touchdowns. Both of these defenses are playing lights out. The key is going to be which offense (specifically the passing game) can get some consistency going. I’ve stuck with Duncanville all season as the team to beat in Region I and there’s no reason to deviate from that thought based on its performance. The much-anticipated Region IV showdown is a rematch of a game played twice a year ago. Judson rolled to a win in the regular season opener over the defending state champions and then in the rematch at DKR Memorial Stadium in Austin, Lake Travis got its revenge in the area playoffs and eventually advanced all the way to the title game before falling to Allen. Neither team had any trouble last week with overmatched opponents from the RGV as Lake Travis, behind seven touchdown passes from Hudson Card, rolled past Weslaco 56-14, while Judson went down to the Valley and demolished San Benito, 69-18. On paper, Judson gets the edge having more team speed across the board with playmakers like do-it-all RB Sincere McCormick, QB Mike Chandler and maybe the state’s most dominating defensive player in DE DeMarvin Leal. The Rockets can fly and are as explosive as teams get, but Lake Travis led by Card a Texas verbal commit and WR Garrett Wilson an Ohio State commit (and finally healthy) has plenty of talent as well. This one comes down to pedigree in the big games and Lake Travis has the massive edge here. Judson has faltered in these big moments the past few years, while LTHS has thrived. In last week’s showdown of undefeated teams, Longview made quite the statement putting up 56 points on the vaunted Austin Vandegrift defense in a 56-28 win. The Lobos led by just seven at halftime, but three touchdowns in less than four minutes in the third quarter broke the game wide open. Longview got 265 rushing yards from QB Haynes King and RB’s Jesse Anderson and Keilyn Williams and the trio combined for five touchdowns on the ground to lead a Longview attack that rolled up 533 yards on the ground. The Lobos will face another stout defense this week in Spring Westfield who has the size and athleticism to deal with the balanced Longview offense. Westfield had a big fourth quarter last week to pull away from feisty Mesquite Horn for a 35-16 win. Trailing 16-14 heading into the final quarter, the Mustangs scored two touchdowns in less than a minute, sparked by an interception after the first touchdown to end the Horn upset bid. RB Rayshawn James led the Westfield attack with 158 rushing yards and a pair of touchdowns on the ground. Westfield’s defense has carried them all season long, but the challenge with Longview’s balanced offense will be its biggest test since the North Shore loss. Expect the Mustangs to hold Longview in check, but I don’t think the offense can do enough damage and by the fourth quarter, Longview pulls away. 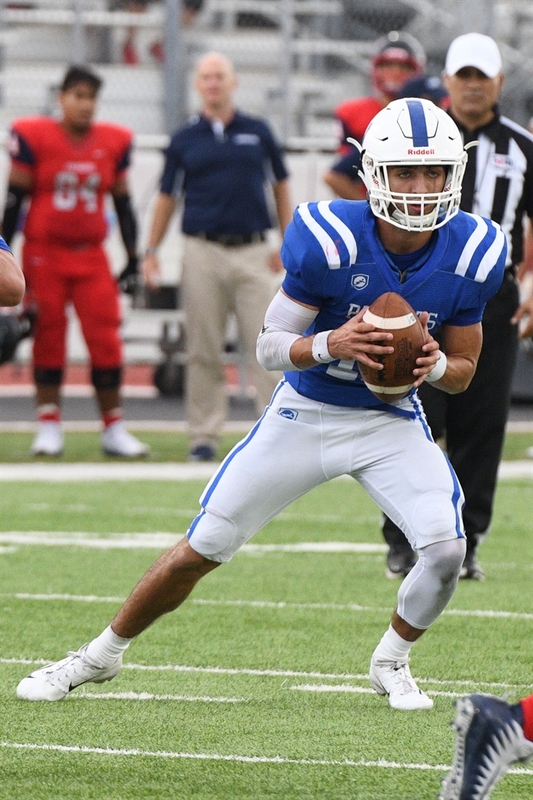 The Bruins dug themselves quite the hole on Saturday at NRG Stadium falling behind upstart Katy Tompkins, but, led by a dynamic offense piloted by QB L’Raven Elia, West Brook battled back for a thrilling 49-45 win a trip to the regional finals. Elia and RB Robert McGrue combined for 410 rushing yards and six touchdowns to led the comeback and carry the flag of the large schools in the Golden Triangle for another week. Another surprise story in the Houston area has been the Cy Creek Cougars. After finishing 5-5 on the regular season, they’ve caught fire in the playoffs winning three straight. Last week’s 43-14 win over Humble Summer Creek may have been their best effort of the season to date as the Cougars had a pick six less than a minute into the game and ran out to a 24-0 halftime lead and never looked back. QB Julian Brown led the attack throwing for 330 yards and a pair of touchdowns, while RB Eddie Jimmerson ran for three scores as well. Both offenses have been high-powered all year so expect a real shootout in the opening game of a doubleheader at NRG, and in these situations, West Brook has thrived all season long. It’s a district rematch of a game played in Week 11 to decide the 4-5A Division I title, but this week it’s a regional title on the line as Birdville looks to take down unbeaten Denton Ryan. After rolling past Grapevine in district play, Birdville needed overtime to escape the Mustangs 28-21. RB Laderrious Mixon ran for 142 yards and two scores and also chipped in 78 receiving yards and a touchdown to lead the Hawks to the hard fought win. Now they’ll look to win their first regional title in school history this week against a Denton Ryan squad that defeated them by 28 points just a month ago. Last week the Raiders went out to Abilene and completely dismantled Lubbock Coronado, 30-0. The Ryan defense, which has been stellar all year, was the story shutting out one the most prolific offenses in West Texas and holding them to just 192 yards of offense. Denton Ryan’s defense is one of the state’s best at this stage and barring a couple of busted assignments or the Raiders offense having a rash of turnovers, I just don’t think Birdville’s offense can do enough damage. Not only does Mission Vets carry the hopes of the school and city on its back, but also an entire region of the state that’s long been laughed at and poked fun at due to its lack of success in the playoffs. But it’s a task that the Patriots have embraced after putting on a show last week stunning unbeaten Corpus Christi Vets 62-55 at the Alamodome. QB Landry Gilpin had a game for the ages in the win accounting for 703 yards of total offense and seven touchdowns in leading the Patriots to the regional finals for the first time in school history. This week the test gets even bigger as an extremely fast and big Wagner squad comes calling. The Thunderbirds have been as dominant as any team in the state. Since its loss to 6A Converse Judson by a touchdown in early September, Wagner hasn’t seen a team stay within 35 points. In last week’s 49-14 win over Corpus Christi Flour Bluff, RB’s L.J. Butler and Karleton Black along with dual threat QB Tobias Weaver rolled to nearly 500 yards on the ground in the win. Mission Vets’ only chance in this game is to speed the pace of the game up and try to lure Wagner into a shootout. The Patriots' lack of size up front and lack of elite speed could mean this is a real tough matchup against the brute physicality and speed of Wagner. It’s a matchup of unbeatens at Pennington Field and if you like watching great play in the trenches, these two teams will make you very happy. Both Aledo and Frisco Reedy have two of the best offensive and defensive lines in Class 5A. The big question in this matchup will be how does the potential cold and rainy weather expected in the DFW area impact the game? Both teams dealt with the rain last week in wins on a rainy Friday night. Aledo knocked off a tough South Oak Cliff squad 28-14 as senior RB Jase McClellan and sophomore WR JoJo Earle combined for all four Bearcats touchdowns. Frisco Reedy rolled past Aledo’s district rival Burleson Centennial, 34-7, and the Reedy defense dominated holding Centennial to just 121 yards of offense. Do-it-all athlete Will Harbour led the way for the Lions kicking a FG, rushing for a touchdown and added a solid night on defense as well. I expect Frisco Reedy to play Aledo to a draw up front, but Aledo’s edge at the skill spots with McClellan and Earle along with that big game pedigree make the difference for Aledo. For the second straight week, Huntsville will deal with a team with incredible speed and athleticism named Marshall. Last week, the Hornets escaped with a thrilling 35-34 win over Marshall High (Marshall, TX) and this week get unbeaten Fort Bend Marshall. Huntsville dug themselves quite the hole last week, falling behind the Mavericks 21-7 but battling back. Huntsville was unable to consistently run the ball and had to rely on the passing arm of Matthew Southern and a key pick six to escape with the win. The team will need their best effort of the year to slow down a ridiculous Fort Bend Marshall squad that just blasted Port Neches-Groves 53-14 a week ago. QB Malik Hornsby led the way for the Buffaloes throwing for 224 yards and two touchdowns and also running for 140 yards and two touchdowns as well. The most impressive showing wasn’t the Marshall offense, it was its defense that held PNG and dynamic QB Roschon Johnson in check to just 14 points. If Fort Bend Marshall’s defense comes up with that kind of effort consistently, there’s not a team in 5A Division II that can stay with them. The top two teams in 4A Division I Region II will meet up in a much-anticipated rematch of their early season showdown won by Argyle in a thriller. Last week, LaVega got pushed by a strong Paris team, but behind the running of John Richards and QB Ara Rauls, the Pirates pulled away for a 38-20 win. LaVega’s defensive line, which is finally healthy after dealing with a rash of injuries looked dominant as well and that will be key if the Pirates hope to contain Argyle’s explosive aerial attack. The Eagles got pushed in a major way last week escaping a massive upset bid from Celina in a 26-22 win. RB Tito Byce ran for 132 yards and two touchdowns, while QB Bo Hogeboom continued his magical season throwing for 242 yards and a score. LaVega’s defense, speed and physical style of play makes it a tough matchup for just about any team in the state and Argyle is no exception. Plus, the Pirates feel like they let one slip away in their Week 2 loss to the Eagles. Look for the Pirates defense to be the key in this game and with possible rainy weather on tap Friday, that ground game will be quite useful as well. It had been a while since Liberty Hill had been pushed, but the Panthers certainly got that last week in a hard fought 35-21 win over previously unbeaten Sealy. LHHS trailed 21-14 at the half, but outscored the Tigers 21-0 in the final two quarters as Kyle Harrison and Shane Gonzalez got the Slot-T going and the Panthers' defense contained the Sealy offense. This week, Liberty Hill’s defense will look to slow down QB Clayton Chadwick and the powerful LaVernia attack. After a sluggish first half , the Bears olled past LaFeria 41-13, Chadwick ran for 129 yards and two scores and he threw for a touchdown as well in the win. LaVernia’s defense will have to be near perfect to slow down the machine that is the Liberty Hill offense. It’s a tradition unlike any other; Cuero vs Navarro in the playoffs. 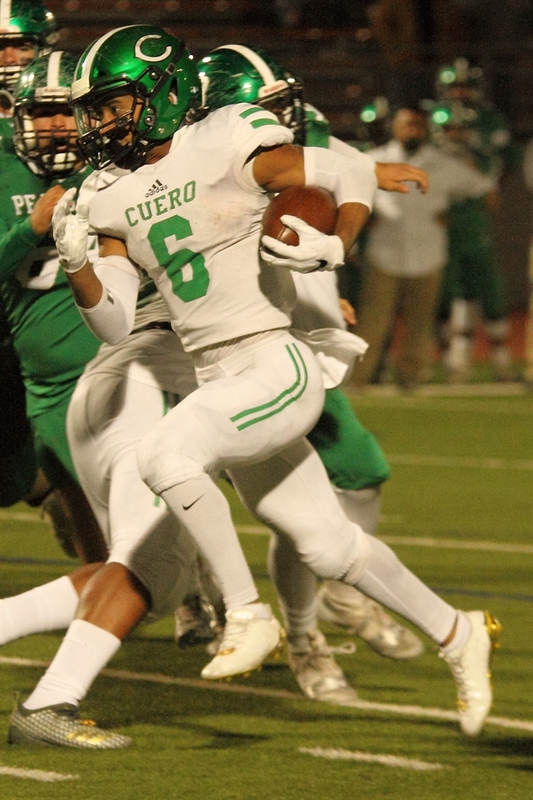 The two Region IV powers are meeting for the sixth straight season in the playoffs with Cuero taking four of the five meetings. This year added a new wrinkle with these two being in the same district for the first time and Cuero in that first meeting dominated with a 43-7 win. The Gobblers are playing as well as any team in the state in 4A Division II and look to be among the favorites to win the title. Last week, they had no trouble with Corpus Christi West Oso rolling the Bears, 59-20. Texas commit Jordan Whittington had another big game with 165 yards of total offense and three touchdowns, while RB Kieran Grant ran for 130 yards and three touchdowns as well. Navarro knocked off a tough Rockport-Fulton squad 28-13 and didn’t need any late heroics like the past two weeks. RB Johnny Alegria led a balanced ground game with 134 yards and a touchdown and a couple of key fourth down stops in the first half allowed Navarro to get out to an early lead and control the game. Navarro will be a big underdog this week, the Panthers will have to slow the tempo and try to limit Cuero’s possessions. That strategy will keep them in shouting distance of the Gobblers for a while, but in the end Cuero’s just got too much firepower. The theme of the playoffs has been rematches and we’ve got another one this week as West Orange-Stark will look to win its fifth straight Region III title as it attempts to defeat Silsbee for the second time this season. WOS took the first meeting 24-21 and with both teams playing its best football of the season, expect another close one. Last week, it was West Orange-Stark that avenged a regular season loss of its own knocking off Jasper, 21-14. RB Kavyn Cooper who finished with 134 yards rushing scored with 2:42 left to lift the Mustangs to the win. The score was set up after WOS recovered a Jasper fumble on the Bulldogs 13-yard line. Silsbee’s explosive offense ran past Giddings, 38-21, as sophomore QB Raymond Foster tossed four touchdown passes, while Chris Martin ran for 154 yards and a touchdown. Versatile Darshon Turk had a touchdown catch, an interception and recovered a fumble as well in the victory. This game is going to come to down to pace. WOS and its tough defense will want to keep the score below about 24 points, anything more than that tips the scales to Silsbee. In the playoffs, especially in Region IIII it’s tough to bet against West Orange-Stark, so give the edge to the navy and silver. Brock will look to continue its Region I dominance with a third regional title in just five years of varsity football as the Eagles take on unbeaten Shallowater. BHS knocked off playoff rival Wall for the fourth time in five years last week with an impressive 35-13 win. RB Toby Morrison ran for 184 yards and a touchdown, while Jake Teskey chipped in a receiving touchdown and a touchdown on the ground as well. The big story in the game was Brock’s defense limiting Wall to just nine first downs and only 145 rushing yards. The challenge this week is a dynamic Shallowater attack led by QB Cutter Sparks. The Mustangs drilled Eastland 56-21 behind 413 yards of offense and four total touchdowns from the dynamic signal caller. SHS jumped out to a quick 21-0 lead and never looked back as the Mustangs offense dominated from the start. Brock has a massive offensive line and size advantage so the key for Shallowater will be trying to jump out quick on Brock to put the team out of their comfort zone. If Brock is able to control the pace and lean on the Mustangs with that big offensive line, Shallowater could wilt in the second half. Edna will get the chance to avenge its only loss of the season as the Cowboys take on district rival Yoakum with the Region IV title on the line. Edna’s defense has been the story all season long allowing just over eight points per game. Last week the team pitched a shutout in a 27-0 win over Rice Consolidated. Edna’s offense isn’t going to wow you with big numbers, but it controls the clock really well and keep your offense off the field. Yoakum won an absolute classic over Goliad ending the Tigers season for the second year in a row with a 38-35 win. Yoakum’s offense had several big plays, but it was sophomore Deandre Johnson who was key as he had a touchdown run and then late in the game, with his team trailing 35-31, blocked a punt and recovered it in the end zone to lift the Bulldogs to the win. Edna gets the edge here if it can contain Yoakum and the big plays that haunted Goliad last week. If the Bulldogs can’t break long plays, I don’t see them sustaining long drives against the Edna defense. With the possible cold and snow that could hit the Texas panhandle this Friday, Canadian and Abernathy decided to move their game up a day to beat the rough weather. Abernathy took care of pesky Tulia 34-20 as QB Bryson Daily ran wild with 326 yards rushing and four touchdowns on the ground and he chopped in a passing score to lead the Antelopes who pulled away in the fourth quarter. Canadian had no such trouble as the Wildcats dispatched district rival Spearman for the second time this season, taking down the Lynx 42-7. QB Casen Cavalier led the explosive Wildcats attack with 389 yards of offense and four total touchdowns, while the Canadian defense had one of its best efforts of the season in containing Spearman. Abernathy’s going to have an edge up front, but Canadian’s just too dynamic and it appears once again it's taken its game to another level as the playoffs have progressed. Gunter will look for its third straight regional title as the Tigers, who have won 44 of their last 45 games, deal with a tough Holliday squad who they beat 30-14 in the regular season. Last week, the Tigers rolled past Comanche taking the Indians apart in an easy 53-14 win. Dylan Jantz had a monster game with four catches for 115 yards and a touchdow. He also ran for 70 yards and a touchdown and threw a touchdown pass to pace the explosive Tigers offense. Holliday got another outstanding defensive effort as the Eagles dismantled Buffalo 38-9. The Eagles held a Buffalo offense averaging 48 points a game without a first down on the first half. The Eagles had three runners with at least 67 yards on the ground to lead a balanced attack. Holliday has been itching for another shot at the Tigers and the team will get it. Expect an intense and physical game since there’s a ton on the line and not much love lost between the two teams. If the weather turns ugly, that could really help Holliday, who is more of a ground and pound style team, where Gunter’s scheme has slightly more passing and is predicated on pitches and outside cuts which could be tough on wet track. The edge goes to Gunter, but Holliday will make this one really close, expect the incomparable Jantz to make a play or two down the stretch the lift the Tigers. New Deal’s offense kept up its incredible pace last week and needed every bit of that offense in a 67-49 win over Panhandle. QB Jett Whitfield and that Lions' offense has topped 40 points 10 times this season and that output may happen once again this week against West Texas High. Whitfield had a monster game last week accounting for 460 yards of offense and eight total touchdowns. West Texas slipped past Sundown last week with a 28-26 win avenging a playoff loss to the Roughnecks a year ago. New Deal just has too much offense for WTHS in this one. It’s a rare Friday afternoon matchup at the Alamodome and once again the Region IV title is on the line. It’s the fifth straight time these teams have played and after Mason stunned Refugio in 2014, the Bobcats have dominated winning three straight in dominating fashion. Last week, Mason had no trouble with surprising Wallis Brazos winning 52-14, RB Klay Klaerner and QB Otto Wofford combined for 266 yards rushing and five touchdowns. Since moving back to the spread offense, Refugio has been an absolute juggernaut and last week’s 56-41 win over Shiner was as impressive as it gets. QB Austin Ochoa ran for six touchdowns and threw for another score. 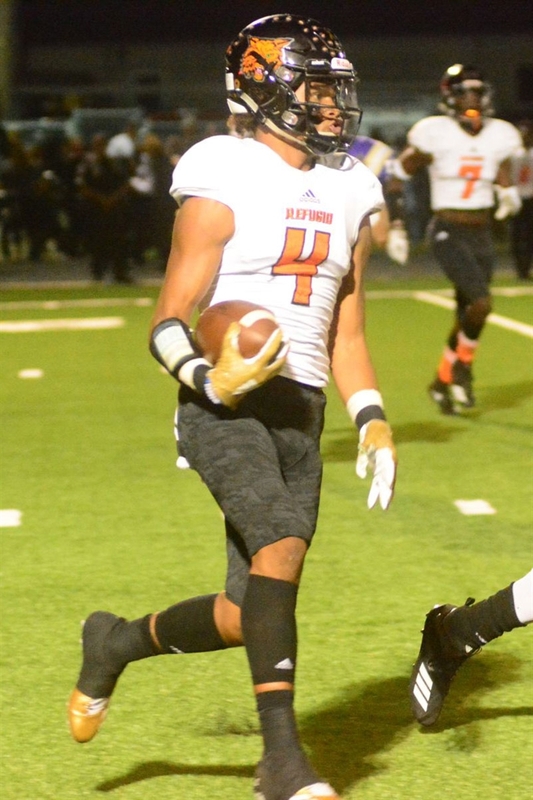 He also accounted for 541 yards of offense to lead the rejuvenated Refugio offensive attack. Refguio’s speed at the skill spots and new-found offensive balance will be the difference once again. Fresh off their stunning upset of Wellington last week, the Hamlin Pied Pipers have a chance to avenge their only loss of the season this week in a rematch with Albany. Last week, Hamlin’s defense had a heroic effort in holding one of the state’s highest scoring offenses in check and got a huge play in the second quarter that turned the game in its favor as Jackson Sepeda returned a WHS fumble 99 yards for a touchdown to swing the game in their favor. On the night, the Pipers forced four Wellington turnovers. Albany has rolled to eight straight wins after starting the season 0-5. The Lions had 34 second half points in the win led by WR/DB Cameron Dacus who caught two touchdown passes and had an interception return for touchdown to lead the Lions' rally. Albany jumped out on Hamlin early and held off a late rally to knock off the Pied Pipers 34-27 in Week 11. Don’t expect Hamlin to come out slow in this one. Under normal circumstances, you might worry about a Hamlin letdown but playing its arch rival who already stunned the team and won nine in a row in the series, that won’t be the case. It’s a battle of defending state champions as defending 2A Division II state champion Muenster plays defending 2A Division I champion Mart. After a tough area round game, Muenster rolled past overmatched Evadale in a 56-0 win. The Hornets led 35-0 at halftime and the defense really impressed, totally shutting down the grind-it-out offense of Evadale. This week the challenge is much different as an incredibly athletic Mart squad will test the Hornets on both sides of the ball. Last week, Mart got a bit of a test but pulled away in the second half blowing past Grapeland 64-22. The challenge will be slowing down Mart’s fantastic 1-2 rushing punch of Tyrek Horne and Shatydrick Bailey who combined for over 400 yards on the ground and eight touchdowns. Muenster will have the edge up front in this game and will need a big game from QB Parker McGrew and WR Danny Luttmer to keep up with the Panthers' speedy offense. Expect a shootout in this one and it’ll come down to which defense can get a stop down the stretch. Each week, six-man insider Leman Saunders will highlight the must-see action in Class 1A. Get in touch with him on Twitter @lemansaunders. On the other side of the DII bracket, top-ranked Strawn will face off with a very athletic Oakwood squad. Oakwood comes in as the underdog, but they can almost match the Greyhounds in the number of potential playmakers. RBs Key Davis (87-1,103 yards, 21 TDs) and Jerimiah Sargent are a solid one-two punch and QB Garett Bean (27-46-2, 627 yards, 16 TDs) can find ways to punish defensive secondaries. Strawn has a better balance of speed and size across the board both offensively and defensively. RBs Tanner Hodgkins and Julian Fraga are coming off a big game last week against Iredell and are primed for another big game this week. Defensively, LB JW Montgomery is a ball hawk and Ivan Ruiz is solid defensive player up front for Strawn. It’s the same scenario I’ve been saying all season, I think Strawn has more powerful an arsenal at their disposal overall. I think they hold off the speedy Panthers and get back to the title game. For my money this is the best game of the week in Class 1A. McLean and Garden City are the only undefeated teams in all of 1A. Defensively, Garden City is outstanding, holding teams to 15.38 ppg. They are led by LB Cesar Chavez, who has 185 tackles on the season. Hunter McMillan (114 tackles, 6 INTs) is another big-time playmaker for the Bearkats to keep an eye on. As a team, the Beakats have 38 takeaways this season to just 13 turnovers. McLean’s defense is just as amazing, having allowed just 7.77 ppg and causing 32 turnovers to their 8! The secret to the Tigers' success has been the lethal triple threat of size, strength and speed and no Tiger embodies that more than RB/LB Ben Crockett (150-2,105 yards, 46 TDs; 107 tackles). Both teams are tough as a barrel of rusty nails so this should make for a great game. 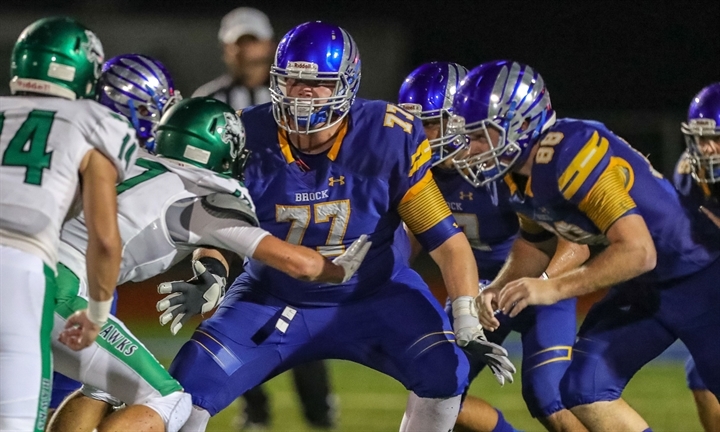 I think the offensive line for McLean is their secret weapon and Crockett running behind those big guys will eventually wear down the Bearkat front line. I’m going to take McLean in a brawl. Leakey is the unquestionable Cinderella team still standing in the 1A playoff picture. The Eagles have a pair of talented backs in Hunter Williams (3,035 yards of total offense; 137 tackles) and Trace Lackey (143-1,113 yards, 24 TDs rushing) and a standout freshman player in Able Montoya (789 yards of total offense). Milford has player of the year candidate Taron Smith (3,276 yards of total offense, 46 passing TDs, 21 rushing TDs) and top defensive lineman Corbin Schrotke (151 tackles). DB Damyan Woodwad has been emerging as another great defensive player for the bulldogs lately as he picked off four passes in last week’s big win over Union Hill. I love the storyline of the Leakey Eagles and they are for sure this year’s poster team of why 1A schools who don’t play six-man should. Still, I think they have an uphill battle in order to win this game. In order to win, Leakey will have to win the turnover battle, control the clock, and make all their extra points. Those things are possible, but Milford is just a much deeper team with too many offensive threats and too much speed in that defensive secondary. I think Leakey puts up a valiant effort, but Milford moves on to play at AT&T stadium.